Chuh from Vietnam Motorbike Tour Export, met us at our hotel this morning, just after 8 o’clock and straight away we liked him. 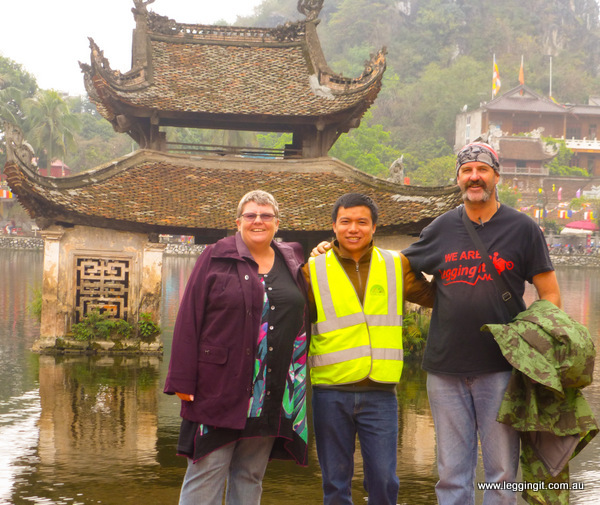 He’d organised a taxi to convey us over to West Hanoi to The University of Hanoi where we’d start our day trip from. It was a nice ride through parts of the city we hadn’t been through before. We passed through Mannikin Street with shop after shop filled with manikins of all colours, its one of the things which we find amazing in the past especially in the Old Quarter many of the streets were full of one product some are still that wayet it makes comparing prices easier. Hanoi has a different feel about it compared with the south. Maybe it’s the weather, the wide tree lined boulevards or the French architecture. 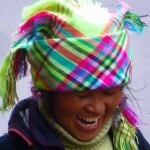 It could be the old men wearing berets, or the stylish women in winter coats and high heels zipping around on Piaggio’s. Whatever it is we love it. We arrived at Hanoi University where Chuh was already waiting for us, bikes are heaps quicker in traffic, and had a drink. Chuh had arranged our safety gear of gloves, helmet (full faced) and there were also High Visibility Vests. Another tour was heading out on the 5 day Tour and they had new XR’s and riding gear. They were heading out with Luc who was all geared up with his off road gear. There were three guys heading out on the tour. Frank Zimmerman from the US of A who was really laid back, along with two mates from Melbourne, Frank and Joe (also part of a social riding group known as the Tasmaniacs who meet up for a yearly ride in Tassie, hence the name) Joe had turned 50 and his brother had bought him a tour as a present. What a great brother. 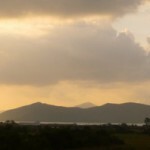 The three adventurers had all the gear and were busily unpacking essential items like walkie talkies, helmet cams, dririder jackets and were debating whether to wear wet weather gear or not. 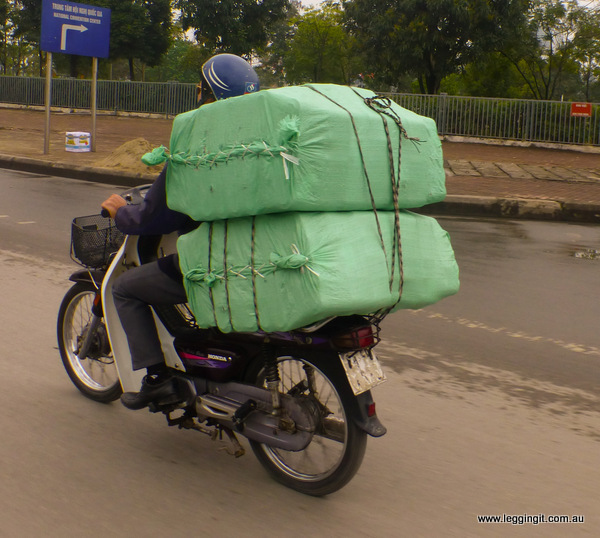 Meanwhile Luc was packing their backpacks into thick heavy duty plastic bags and strapping them onto their bike racks. We think Luc knew they were going to get wet and dirty. 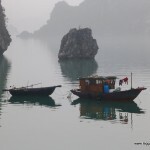 We think next time we come back to Hanoi we’ll do the five day tour. We were really impressed, firstly with the immaculate state of the motorcycles and the new safety gear. It was nice to finally have my head inside a nice new clean helmet and my hands inside new gloves again. I started wearing a bandanna since wearing hire helmets, to firstly keep my head clean and hire helmets never fit properly. The full face fitted snugly around my face and the visor was pristine. Chuh had arranged two bikes to choose from a Honda WH 125-11 Fortune and a Honda WH 125 Master. He also offered an XR if we preferred. I took both bikes for a spin around the University and they both handled beautifully. The only difference being the Fortune was a little higher. After riding a few other bikes with Chinese 1-5 down gearboxes around Asia it was nice to be back on a 1 down 4 up. We continued on some of the main roads, the traffic wasn’t too bad but with the early morning drizzle the roads were quite slippery so we picked the driest line and tried to stay away from the mud on the outer lane. There seemed to be some new condos being built on the outskirts of the city but I don’t know how people can live in houses that are all alike. The adventurers caught up with us on the freeway and we waved them farewell and good luck as they passed. Quite close to the city the market gardens and rice paddies started and it was wonderful to see the locals going about their daily life. 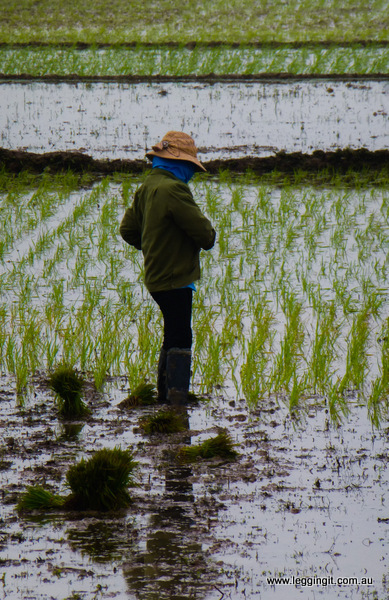 We stopped to take some photos of ladies planting rice, and they waved and smiled. 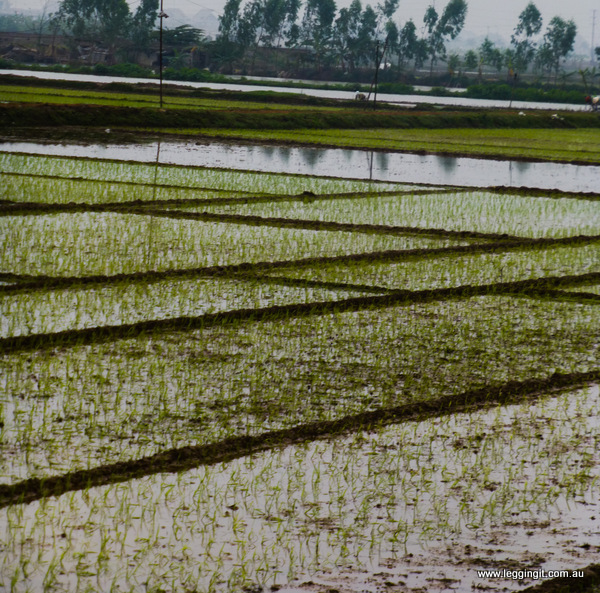 We then started heading out into the back blocks passing rows and rows of paddies with locals all bent over planting rice. Our first stop was Thay Pagoda at Sai Son village. When we got off the bike, a look of amazement spread across the faces of the ladies at the stalls as they made the universal “how tall is this guy hand gesture” hmmm not too many tall people must come out this way. Before we went up to the Pagoda we stopped at the village meeting house, which was also a temple to worship an ancient general. We spotted a phoenix shading on a turtle beside the altar and Chuh told us a wonderful story. Many years ago when there was nothing but water the phoenix was flying around looking for land but couldn’t find any. The turtle came to the surface and said for it to rest on its back. Each day the turtle came to the surface so the Phoenix could rest. Then the water dried out and there was no water left for the turtle and he was slowly making his way towards the water, the phoenix filled a lotus flower with water and everyday would visit the turtle to repay the favour. In the temple three old men were sitting, drinking tea, they invited us in and showed us around. They invited us to sit and drink tea with them which was pretty cool and they were asking questions about us. We said we were from Australia and they were pretty pleased with that. 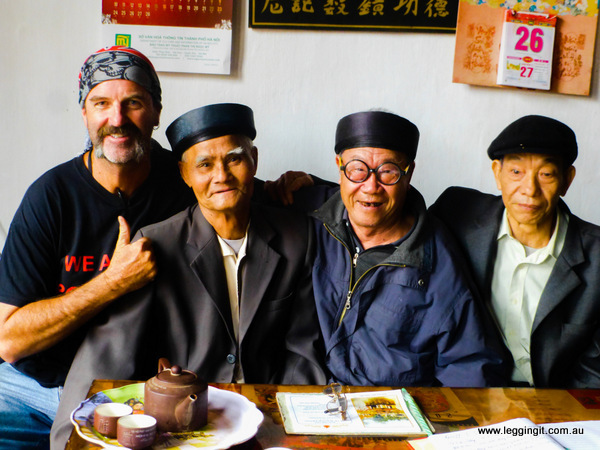 We thanked them for the tea, said goodbye and headed to the pagoda. The pagoda was originally built in the 11th century, and consists of three sections. The first part is for the worship of the monks and is also used for ceremonies. The middle part is for the worship of Buddha, with three Buddhas sitting higher than everything else giving them the ability to see the present, psat and future. There’s also a lead Buddha which is at the front. Not all Buddhists have to attend the temple everyday but usually on the 1st and 15th of the lunar month. 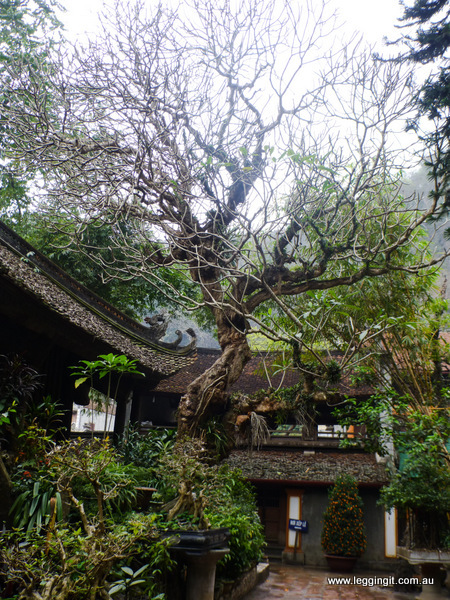 The last building was for the worship of the founder of the pagoda, Tu Dao Hanh. The buildings were simple wooden buildings with massive step overs (there was no way evil spirits could get in there or short legged people, luckily they had step ups) The pagoda had beautiful gardens, and a serene feel about it. 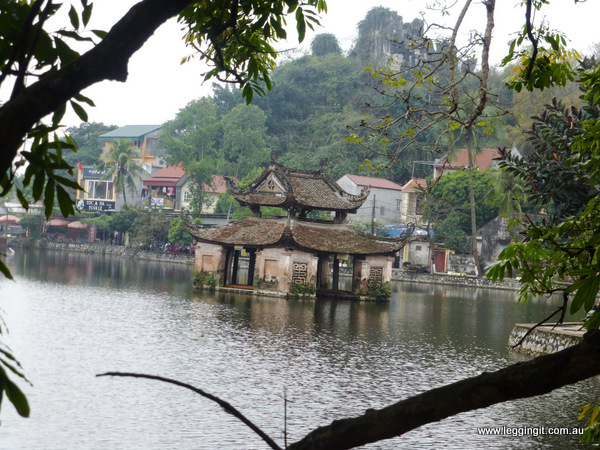 In front of the pagoda was a half moon bridge and Long Tri lake which contains an original water puppet stage. We were told the Pagoda has great Feng Shui as there’s a lake in front and a mountain behind it. I don’t know about Feng Shui but it’s really beautiful. We headed off through the back streets and back out into the countryside and stopped at Va Temple. 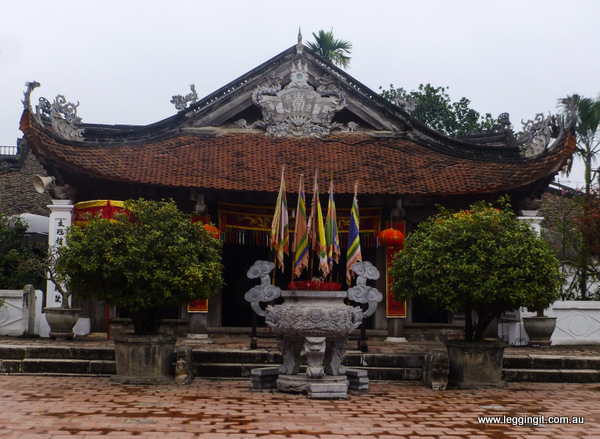 The temple is dedicated an ancient general Duc Thanh Tan who was the guardian of one of the gates to Hanoi under the first king. Many people were stopping to pray to the general as he is a sacred saint bringing good things to people. It had two towers at he entry one for a gong the other a drum. 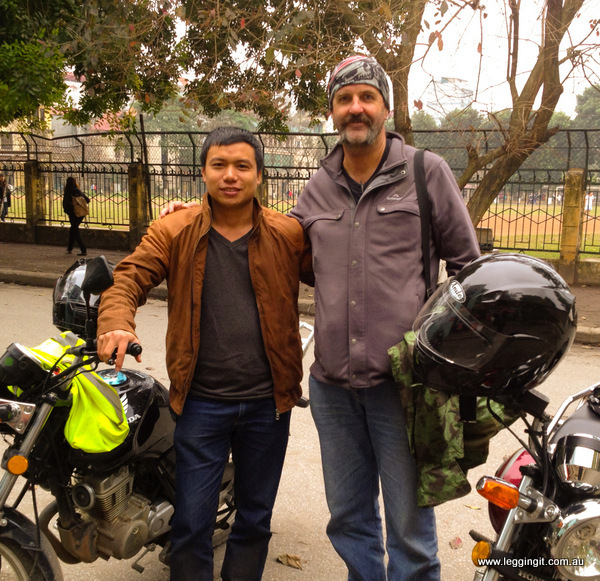 We rode along concrete roads, dirt roads, tracks across rice paddies and along the banks of irrigation ditches, through forests of gum trees taking in the countryside which was just spectacular. We stopped at a local shop for a drink and to borrow their convenience. I popped my shoes off to enter their house and when I went to step into their toilet I realised the floor was wet as it was also a shower. Luckily for me there was a small pair of plastic scuffs on the floor, so I squeezed my sock covered feet into them and shuffled over to the toilet. It really is so nice that people would let you use their toilet in their house. True Vietnamese hospitality. Just up the road we stopped at Duong Lam village. The village is about 1500 years old and is a popular spot on the weekends for locals, with all the ancient buildings. We spotted a couple getting wedding photos done so popped over and took some too, wishing them good luck for the future. 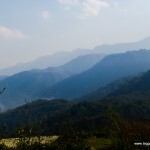 The village was also the birthplace of two kings including the first king Ngo Quyen, so is quite revered. Along the alleys ladies were selling a local cake Che Lam about 1cm thick and 30 cms wide and round, made from rice flour and ginger. 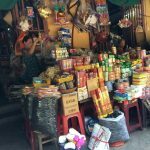 We followed Chuh through the alleys and he showed us to a local house owned by Mr Hung. Mr Hung invited us into his house where he served us green tea and slices of Che Lam. He told us the house had been built in 1643 and that his family had lived in the house for 12 generations. The house was divided into sections, one part for sleeping, another eating, and right in the middle the altar to worship the ancestors. In between the main building and the other buildings circling the yard was a garden with star fruit trees and betel nut. Mr Hung had converted some of the outer buildings into an eating area and his family had served up a feast for us of fried spring rolls, beef coated in sesame seeds, chicken, choko, steamed bean sprouts, spicy salad and rice noodles with peanuts, and of course rice, plus a bottle of rice wine. Despite giving it a good hard go we couldn’t eat it all, and had to leave some of the rice. We walked around the village through the backstreets and stopped at a place where the lady makes piquant smelling soy sauce. In her yard is about twenty large earthen pots with soy sauce slowly fermenting into an orangey brown coloured sauce. We were invited into her house and were served more Che Lam and green tea. Her house had an altar in the centre and lots of Christian saints portraits, along with family photos, some of which were extremely old black and white photos. The lovely lady force fed us Che Lam and tea despite us just finishing lunch only minutes ago I found it hard to insult her by not eating. It reminded me of growing up in he country with bottomless cups of tea and not letting anyone leave your house unless they were fed. Good old fashioned hospitality. We would’ve loved to take a few bottles of her soy sauce home. Not far from Duong Lam we stopped at another temple dedicated to the much revered first king Ngo Quyen. The man who defeated the Chinese at the battle of Bach Dang River, at Haiphong in 938 and as a result Annam (modern day Vietnam) became a separate country ending 1,000 years of Chinese rule. 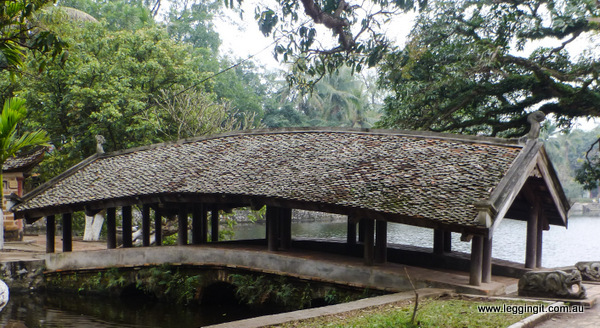 Our last stop was Mia Pagoda also not far from Duong Lam. 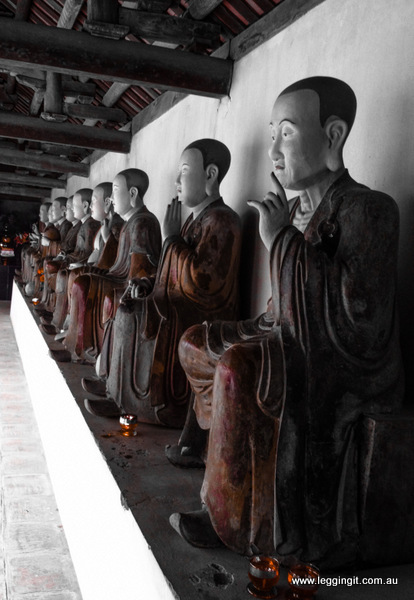 There were heaps of statues, including a few statues of Kuan Yin set in caves. Kuan Yin is revered throughout Asia as the goddess of mercy. There were beautiful bowls filled with chrysanthemums lining the front of the main pagoda and statues of La La’s, good men on their way to becoming Buddhas. We took the shortcuts home past rice paddies with the family plots in the centre, through timber milling areas, along the red river, along dirt roads until about 15 kms from the uni. Then it was traffic and trying to keep on Chuh’s back mudguard. One thing I enjoyed about riding behind Chuh all day was that when we got into heavy traffic and he got a little ahead he would stand up on his foot pegs instantly making him visible to us. He kept us in his mirrors and if we stopped he would stop ensuring we would never get lost. He also used hand signals informing us to stop, danger slow down. We made our way back into the uni and parked up. The taxi back to the hotel was a little more sightseeing for us as the taxi went a different route. this time we went past the Hanoi Citadel, the Presidential Palace and Goldfish street. 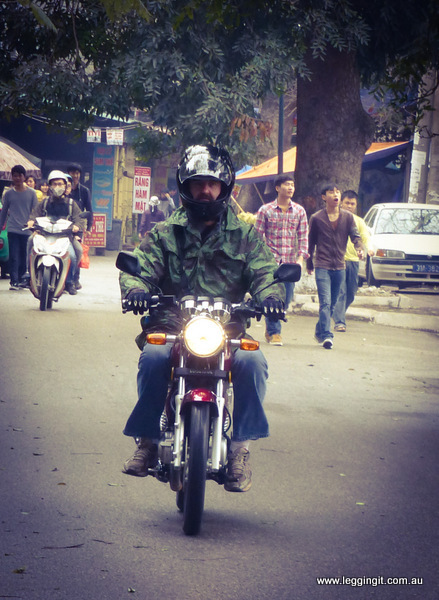 This little story doesn’t do justice to the feeling of joy we felt today riding through the villages around Hanoi. 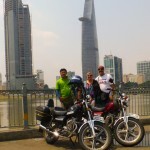 Thanks so much Chuh at Hanoi Motorcycle Tours for a wonderful day and hope to be riding with you again soon.